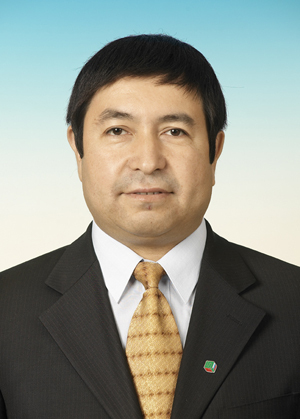 Jilili, male, born in November of 1963 in Baicheng County, Xinjiang, Uygur nationality, a Ph D. In 1986 he graduated from the department of natural geography of Xinjiang University majoring in natural geography and in July of the same year was assigned to work at Xinjiang Institute of Ecology and Geography under the CAS till now. From September of 2001 to April of 2005, he went to study at the geography department of Moscow University in Russia under the State Scholarship Fund from the CAS with a doctor's degree in geographic ecology. In 1997 he was appointed associate research fellow and in 2008 was promoted to research fellow. Now he is assistant to the director of Xinjiang Institute of Ecology and Geography under the CAS, research fellow and master's tutor, mainly engaged in the researches on resource environment in arid region, eco-security and change in landscape as well as cooperative research between Russia and countries in Central Asia.